Considering all of the anticipation that led up to this one night, it can be a little hard to believe that the 2015 Emmys Awards are already over. We saw highlights that Viola Davis becoming the first black woman to win the Lead Actress in a Drama Series award, and low points like Amy Poehler getting cheated out of the Emmy that we were all hoping she would win this year. (Though Julia Louis-Dreyfus has certainly earned her consecutive wins of the award.) But what we didn't see was Amy Schumer having fun backstage at the Emmys, the kind of fun that again makes you wish that you were part of her squad. I almost can't even remember a time when it was Taylor Swift's squad that I wanted to join; I don't think even Swift's squad has quite as much fun as Schumer's "Dancing On Billy Joel's Piano" Squad. And these photos just prove my point. From the very start, we could tell that Schumer came out to have a good time because her date for the evening was, in fact, her sister, Kim Caramele, who she brought with her to her red carpet interview with E! Network and who she brought on stage with her to accept the award. That warm, affectionate, thrilled, and sometimes overwhelmed energy carried into her Emmy acceptance speech — for which she admitted she had nothing prepared — and certainly bubbled over into her backstage antics both during the ceremony and afterward. Here are six backstage Schumer moments that make you wish you were best friends with her. Schumer will be appearing in a cameo role next season... as herself, doing a stand-up routine about the treatment of women in Westeros, and how she, in fact, is the one who deserves to ultimately sit in the Iron Throne. Don't fact check that. This is my face when anyone talks to me, let alone when anyone talks to me with a microphone in their hand and a microphone in my hand. Schumer just gets me, you guys. And, in that moment, we all wished that we were Mel Brooks. Not only did Schumer land that thrilling win for her awesomely feminist and awesomely socially conscious television show, but everyone was practically ganging up on her backstage to congratulate her on taking home the award. Talk about support. If that's not the first thing that you would do with your Emmy award, then clearly you don't know how to have fun and enjoy the little things in life. These are just a small sampling of the antics that Schumer got up to backstage at the Emmys, but they're more than enough to prove my point. 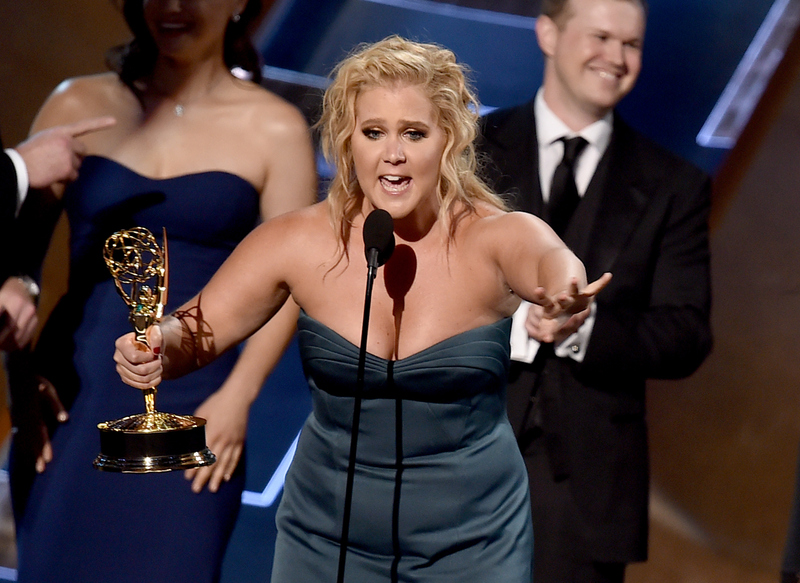 Schumer came out to the Emmys to have a good time whether she won or lost in her category, and she certainly lived up to that goal with the statue in hand. BRB, filling out an application that I made up myself in order to land myself the next place in Schumer's squad.